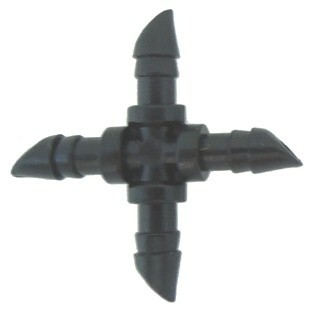 1/4" Cross is used with 1/4" micro tubing, 1/4" soaker hose or 1/4"dripperline, to connect in four directions. Excellent when watering garden boxes, hanging baskets, flower pots, and vegetable gardens. Use to create multiple circles in larger pots, or around plants. The circles can represent 1/4" soaker hose or micro dripline.